The Wonders of Creation Holy Bible is a beautiful book. It is a lovely hardcover Bible with the New International Version translation. I really love the cover art, which features both black and white patterns and bold splashes of color. What makes this Bible very unique are 50 pages of illustrations to be colored. Each page features a key Bible verse. 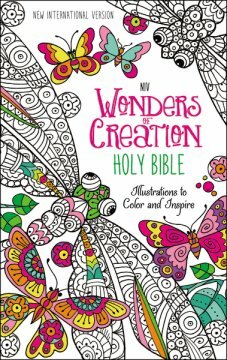 The illustrations are detailed, and anyone who enjoys coloring will find them both relaxing and a good way to meditate on the featured Bible verses. The book opens flat, for ease of reading and for coloring. It also has a presentation page, and would make a great gift! It has a ribbon bookmark. Highly recommended for anyone who wants to combine Bible reading and creativity! I received this book from BookLook Bloggers.